U.S. Attorney Preet Bharara ’93, Dean David M. Schizer, and Senior U.S. District Judge Jack B. Weinstein ’48 at the Wien Prize luncheon. The annual Columbia Law School award honors lawyers who make an outstanding contribution to the public good. 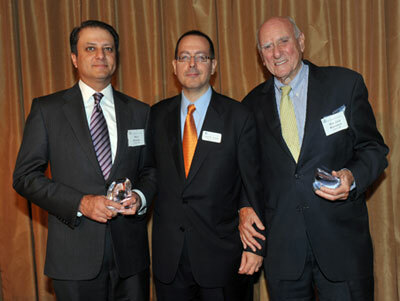 Distinguished alumni, faculty, and guests gathered in the grand ballroom of The Pierre in Manhattan on Nov. 8 to honor this year’s recipients of the Lawrence A. Wien Prize for Social Responsibility, Judge Jack B. Weinstein ’48 and Preet Bharara ’93. Columbia Law School established the award in 1982 through the generosity of prominent philanthropist Lawrence A. Wien ’27. The honor recognizes lawyers who make outstanding contributions to the public good through their legal careers. Weinstein, a senior U.S. district court judge for the Eastern District of New York, has exerted enormous influence in the field of mass tort litigation, while Bharara has tackled organized crime, financial fraud, public corruption, and terrorism as the U.S. Attorney for the Southern District of New York. 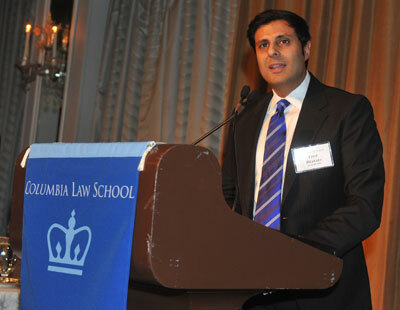 “There is nothing, in my opinion, more inspiring to celebrate than the great legacy of public service at Columbia Law School as exemplified by our two spectacular honorees, Jack Weinstein and Preet Bharara,” David M. Schizer, Dean and the Lucy G. Moses Professor of Law, told the audience. Emotions ran high at times during the event as speakers and guests feted the honorees’ dedication to public service. When it came time for Bharara to receive his award, Dean Schizer made a surprise announcement that he had decided to relinquish his presenting duties to someone significantly closer to the honoree: Bharara’s brother, Vinit Bharara ’96. Vinit Bharara ’96 says his brother, Preet Bharara, showed a passion for fairness even in childhood. Vinit Bharara told the audience that his brother’s passion for fairness and equality was evident even in childhood, when he ensured that household chores and privileges—like access to the TV remote—were always split 50-50 between the two siblings. As he moved toward adulthood, Preet Bharara’s commitment to justice only intensified, his brother said in a poignant speech. As an example of this acute sense of right and wrong, Vinit Bharara quoted excerpts from the high school graduation address his brother gave as class valedictorian in which he defended a teacher unfairly dismissed by the principal. Dean Schizer echoed this commitment to the common good in presenting the award to Weinstein, a Law School faculty member from 1952 to 1998 who has presided over thousands of cases during more than 40 years on the federal bench. Lauding Weinstein’s brilliance and creativity, Dean Schizer quoted Professor John C. Coffee Jr.’s assessment of the judge’s approach to the bench. “A unique and critical element of the Weinstein style is a quiet but determined recognition that there are moral imperatives in judging, and the judge cannot be used, even indirectly and minimally, to assist the state to achieve an unjust end,” Dean Schizer cited Coffee as saying. Weinstein took the stage as the event’s final speaker, telling of the incredible devotion of the Law School’s professors to their students when he arrived as part of the Class of 1948. “We understood almost immediately that we were joining a glorious profession with the obligation to improve society after the horrors of the Depression and the war that we had seen and gone through as participants,” Weinstein said.